A mesmerizingly magnificent Brooklyn (New York) Brownstoner, featured in the January 2010 issue of US Vogue, and the domain of Olya Thompson, "a Muscovite textile designer and former dancer often sighted around town in beautiful, ethereal outfits, with her equally romantic-looking husband, Charles, a photographer". You can read the "edited for vogue.com" article here on Vogue.com. 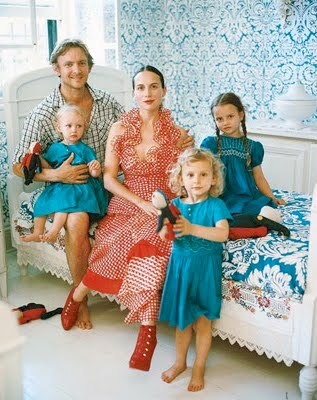 "My Blue Heaven The Thompsons, in the Blue Room, covered in Farrow & Ball wallpaper. Olya wears a vintage Geoffrey Beene dress." "A Walk in the Park Natalia (age three), Anastasia (six), and Marusya (two), in front of Summer Bubbles (2008), by Alexander Vinogradov and Vladimir Dubossarsky." 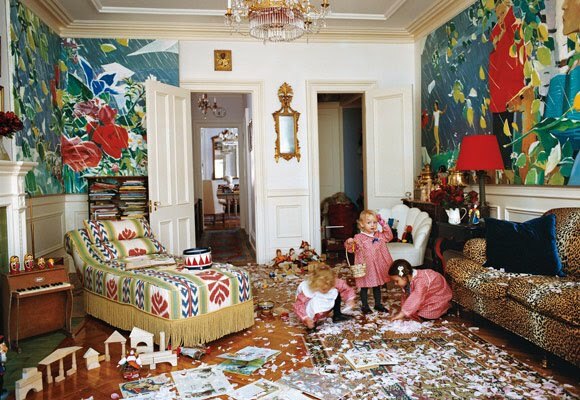 "Room to Grow The nursery after a petal-throwing party. The multipanel mural painting, Windy, is by Alexander Vinogradov and Vladimir Dubossarsky, 2004. Girls' dresses throughout by Flora and Henri." "Tiny Dancer Anastasia strikes a pose in the sitting room, decorated with 18th-century Sicilian sofas and bergères. 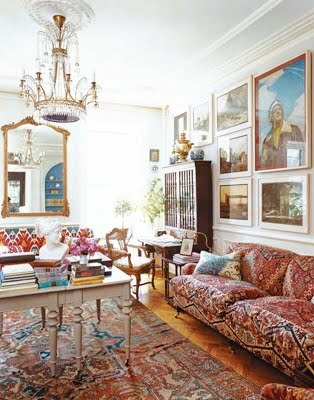 The slipper chairs are upholstered in antique kilims, the cane-back armchairs in Le Manach fabrics." "Well Read The library, its walls hung with Russian Socialist Realist drawings." 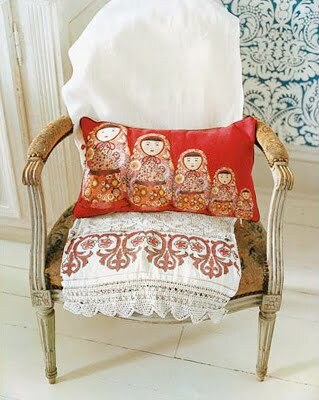 "Welcome to the Dollhouse An antique Russian chair found in a Moscow flea market, with a matryoshka-doll pillow and vintage Russian embroidery." 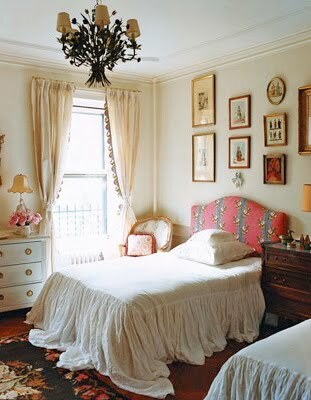 "Prints Charming Anastasia and Natalia's bedroom, with vintage-linen bed covers and Le Manach headboards." "Olya and Anastasia, photographed by Charles, in a gilded French frame." i loved this layout - so much rich detail...beautiful textiles too! so beautiful (both the family and the home)! I love the blue room with the Farrow & Ball wallpaper especially! write content for you? I wouldn't mind writing a post or elaborating on some of the subjects you write regarding here. Again, awesome weblog! Hey there your website url: http://www.blogger.com/comment. home page button. You might want to have this checked.